Learn how ALEC negatively impacts the social, environmental, and economic justice movements in Colorado and throughout the country. Experts in the fields of environmental conservation, net neutrality, racial justice, voting rights, campaign finance reform, public education, and women’s rights will discuss how ALEC affects their work–and what we can do to fight back. This event is free, and lunch will be served. More information and RSVP here. Come find out which elected officials in Colorado have been caught collaborating with ALEC, while joining activists who stand united telling Betsy DeVos and her ALEC friends they are not welcome in Colorado. More information and RSVP here. Join the Sierra Club on Wednesday at 12 pm outside of the Hyatt Regency Hotel to let Ryan Zinke (US Department of the Interior Secretary) know we won’t stand for his agenda to shrink our national monuments and parks. By attending the ALEC conference here in Denver, he is continuing to prove that his interests lie with big corporations and their lobbyists that want to pollute our air and take our public lands out of our hands. More information here and RSVP. Direct action light protest Wednesday night at 9pm, at 14th and California in Denver—outside the 44th ALEC Annual Meeting. We’ll be broadcasting on Facebook live, and educating in person and via social media. Let’s have some fun! Do you have an ALEC resistance event that you would like to add? Email alecindenver@gmail.com. 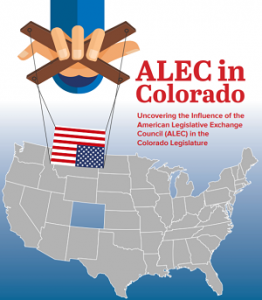 Colorado Common Cause recently released a report on the influence of the American Legislative Exchange Council (ALEC) in the Colorado legislature. Read it here. The report includes a thorough examination of Colorado legislators with ties to ALEC, based on membership dues and other fees paid to the organization. Researchers also inspected bills introduced into the Colorado General Assembly in 2017, comparing them with ALEC model legislation. The report highlights ALEC’s corporate members and explores funding the organization has received from the Coors family and Koch brothers. Finally, it reviews how ALEC abuses its public charity status with the IRS, effectively making their corporate donors eligible for tax deductions. The American Legislative Exchange Council—known as ALEC—will hold their annual meeting this year at the Hyatt Regency in downtown Denver from July 19th to 21st. Hundreds of state legislators and corporate lobbyists from around the country are expected to attend, and several high-profile members of the Trump administration (including US Secretary of Education Betsy DeVos) are scheduled to speak at the conference. Join us as we resist ALEC. The American Legislative Exchange Council—commonly known as ALEC—is an organization that brings together state legislators from across the country with lobbyists from some of the largest corporations in the world. Together, they develop pro-business legislation behind closed doors and without public input. These bills are then introduced into state legislatures across the country, where they can become law. ALEC serves the interests of big business. They work to loosen environmental regulations, enforce stricter voter identification rules, weaken labor unions and the rights of workers, de-fund public education and public health programs, defeat net neutrality, and more. The organization is registered with the IRS as a charity–meaning their corporate donors can get a tax write-off for their lobbying. For more information on ALEC, visit the Center for Media and Democracy’s website, ALEC Exposed, and watch the Bill Moyers documentary, United States of ALEC.